When questing on the behalf of an aging wizard, or by the command of a noble ruler, never venture forth without your swords. Treachery and unnatural perils may mar the way, so secure your weaponry with the Double LARP Sword Hanger. 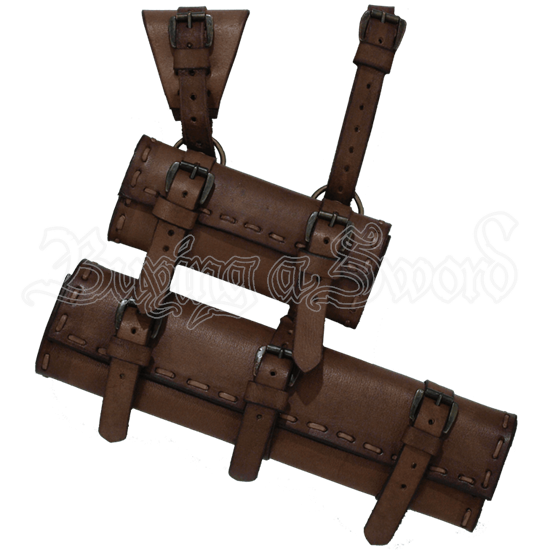 This double hanger has two frogs that will accommodate just about any kind of weapon from medium to long length swords to daggers, axes, or maces. Set the circumference of each holder by adjusting its respective buckle straps. Two adjustable loops secure the double hanger to a belt or other attachments. You can also set its angle. Three buckles line the larger frog, while two appear on the smaller holder. Thick stitching lines the edges and reinforces the structure and durability of the frogs. A soft suede inner lining helps keep your LARP weapons in top form.